Cheese is a really hard thing to give up as a vegan. Not only is it delicious but it adds an unparalleled texture that is hard to find in the vegan spectrum. Vegan cheeses are quite different than dairy cheeses, but still are somewhat familiar in texture, although it is hard to get the stretchiness that we love so much. When transitioning between vegetarian and vegan, many of us don't realize that certain cheeses are not vegetarian at all. Parmigiano Reggiano for example, is created with calf rennet, which is a truly disturbing substance. Rennet is sourced from the stomach lining of an unweaned veal calf that is dried and chopped to create the coagulating substance for cheese. Not only are you eating diary, but you are also eating organ meat! Of course there are other cheese that are vegetarian safe, like paneer and ricotta. Check the ingredients before purchasing to see what kind of rennet was used. 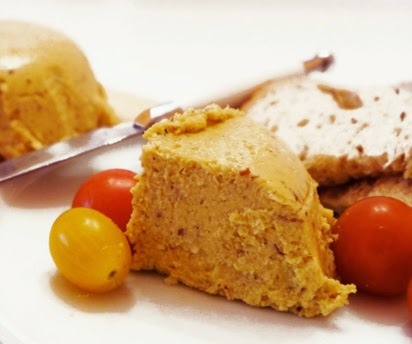 With that aside, a vegan cheese like cheddar is quite simple to make at home. I like to buy my ingredients at an Asian grocery store, as it is much cheaper than a health food store. In a sauce pan, mix agar agar and water over medium heat, stirring constantly until dissolved. In a blender combine the remainder of ingredients and blend. Add the agar agar to this mixture and blend until smooth. Simmer gently over medium heat for five minutes. Transfer to a glass container and chill for at least an hour so that it is firm. The cheese is now ready and can be added to sandwiches, eaten on crackers or baked into other dishes.